Professor John G. Turner, author of the book Brigham Young: Pioneer Prophet, is Professor of Religious Studies at George Mason. 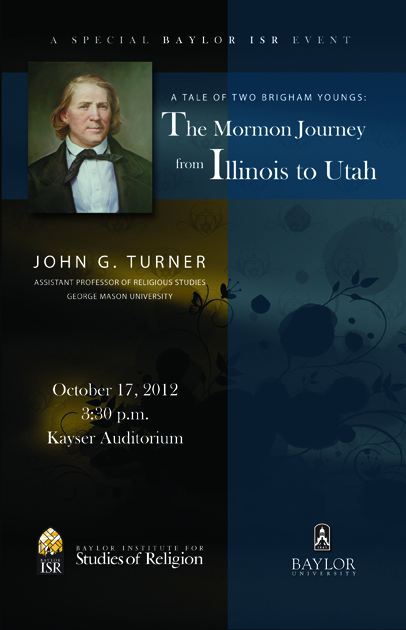 Professor Turner will lecture on his new book – Brigham Young: Pioneer Prophet. Brigham Young was a rough-hewn craftsman from New York whose impoverished and obscure life was electrified by the Mormon faith. He trudged around the United States and England to gain converts for Mormonism, spoke in spiritual tongues, married more than fifty women, and eventually transformed a barren desert into his vision of the Kingdom of God. While previous accounts of his life have been distorted by hagiography or polemical exposé, John G. Turner provides a fully realized portrait of a colossal figure in American religion, politics, and westward expansion.